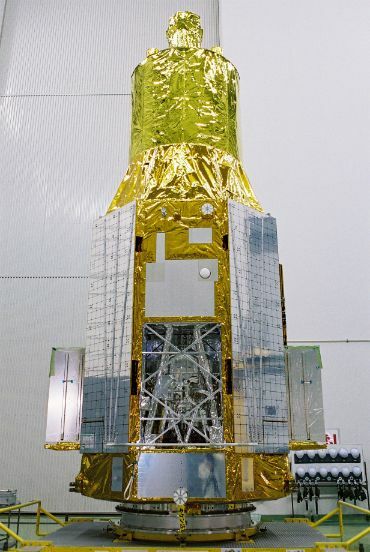 Astro-H is an X-Ray astronomy satellite developed by the Japanese Aerospace Exploration Agency as the sixth in a series of highly successful X-Ray observatories deployed in orbit. It will explore the high-energy phenomena around black holes and supernova explosions, and observe clusters of galaxies characterized by high-temperature plasma. The spacecraft is outfitted with four state of the art instruments to deliver the highest energy resolution ever achieved in measurements at energies of 3 to 100 Kilo-Electronvolt. The satellite will be able to make simultaneous measurements across a broad energy range from soft X-rays to gamma-rays, opening up an enormous discovery space for a variety of objects. The Astro-H mission is expected to deliver breakthrough results in a diverse area of science, ranging from the large-scale structure of the universe and its evolution to the behavior of matter in strong gravitational fields, the physical conditions at sites of cosmic-ray acceleration, and the study of dark matter in galaxy clusters. 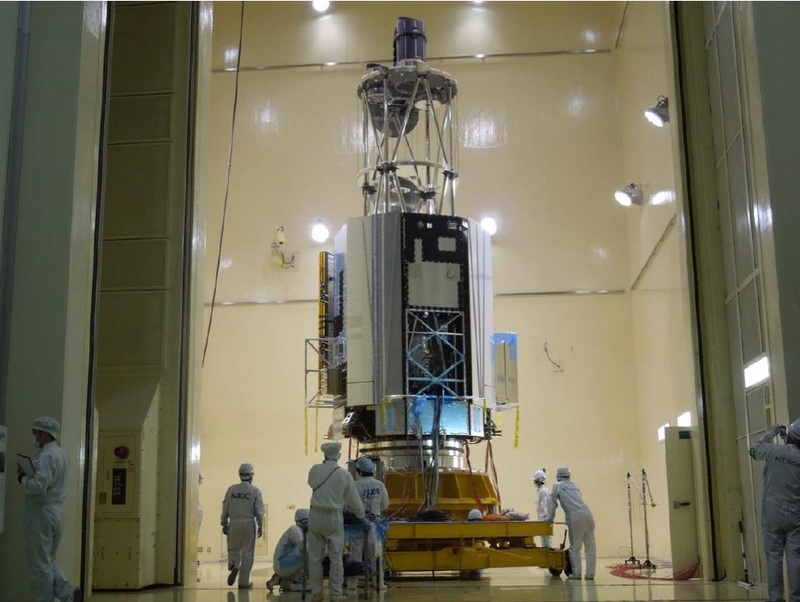 The mission is the result of an international cooperation involving over 70 institutions from Japan, the U.S., Canada and Europe including NASA and the European Space Agency in addition to a number of renowned universities. The X-ray range of the electromagnetic spectrum is suitable for probing extreme environments in the universe like areas near black holes or neutron stars, high-temperature gas and zones of electron acceleration. Observing galaxy clusters and revealing their historical evolution will lead to an improved understanding of how the largest structures in the universe form and evolve. X-ray observations can also provide information on the role played by supermassive black holes in the evolution of galaxies. 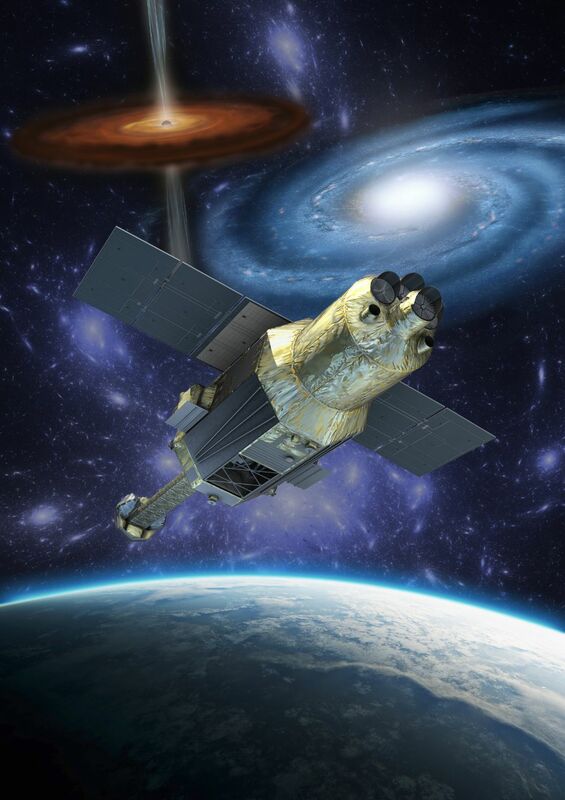 Astro-H will observe galaxy clusters and measure the interplay between the thermal energy of the internal cluster medium and the kinetic energy of sub-clusters from which the clusters are formed. Data collected in X-ray images and spectra will also permit a measurement of the non-thermal energy and chemical composition of galaxy clusters and so directly trace back their dynamic evolution. 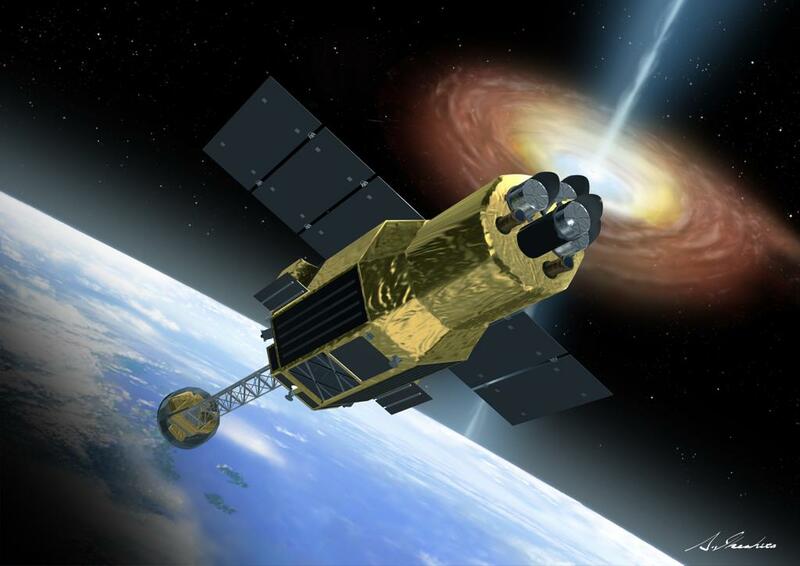 Looking at supermassive black holes, Astro-H will study their evolution and the way they influence galaxy formation with a sensitivity surpassing currently operating satellites by a factor of 100. To better understand the extreme conditions found in areas of the universe, Astro-H will look at the motion of dark matter in proximity to black holes to study the gravitational distortion of space, the structure of relativistic space-time and the physics of accretion processes. Astro-H will also examine the physical conditions of sites where cosmic ray particles are accelerated by processes such as gravity, collisions, and stellar explosions. Dark matter will be mapped in clusters of galaxies and the total mass of clusters at different ages will be determined by Astro-H.
To achieve the findings listed above, Astro-H will conduct high-resolution spectroscopy, hard and soft X-ray imaging and gamma ray measurements. 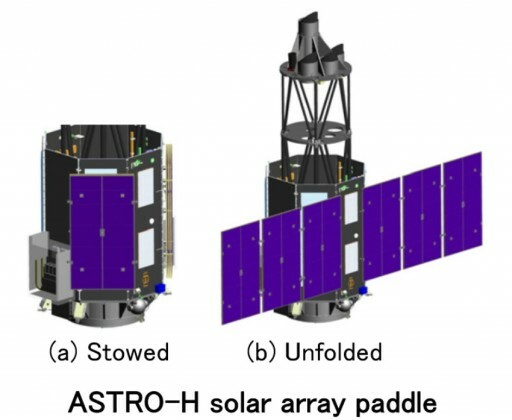 The Astro-H spacecraft has a mass of 2,700 Kilograms and measures about six meters in length in its launch configuration. 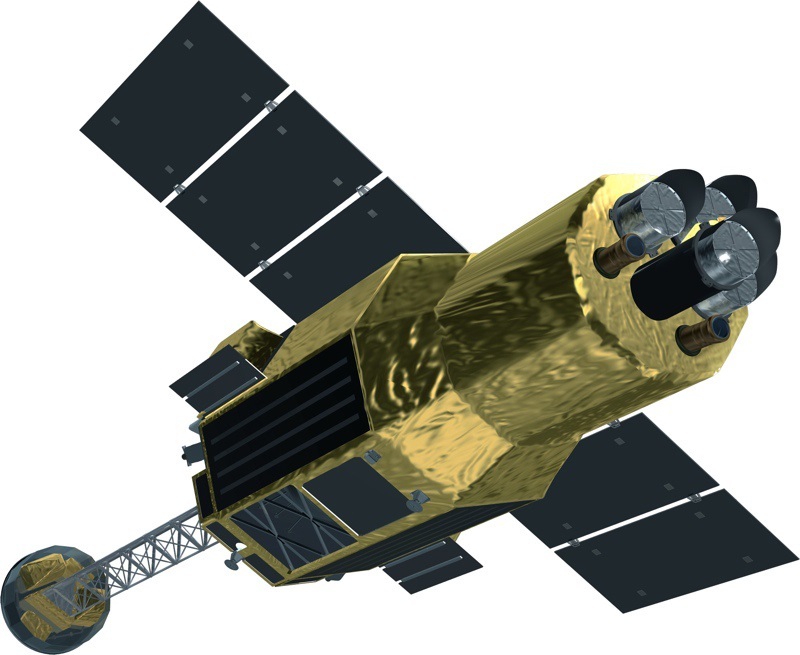 The satellite is based on an octagonal satellite platform featuring a truss structure on its inside to provide ultra-stable mounting platforms for the optical system components. The four focusing telescopes, two Soft X-Ray Telescopes and two Hard X-Ray Telescopes, are installed on a Fixed Optical Bench. 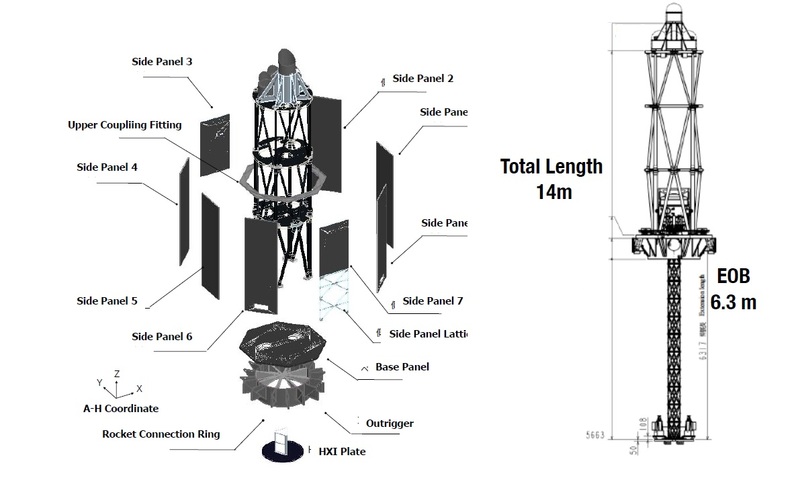 To facilitate the required focal length for the Hard X-Ray Telescopes, their detectors are installed at the end of a six-meter Extendable Optical Bench. 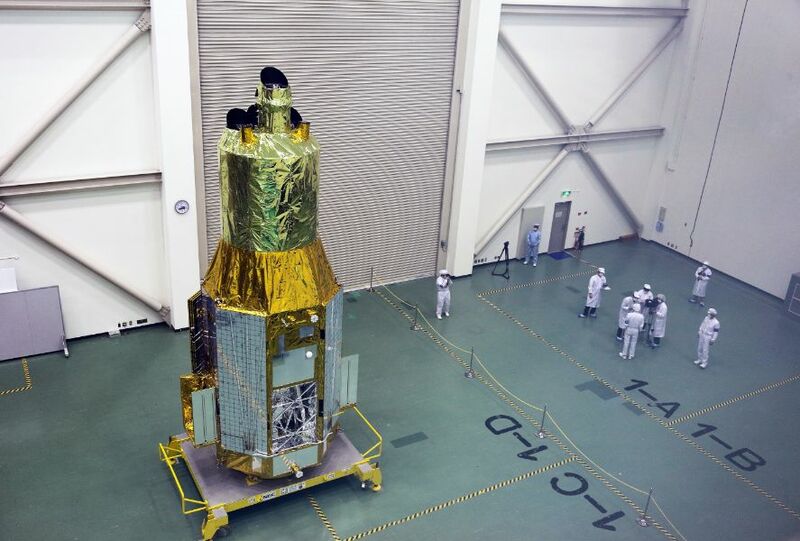 The Astro-H satellite builds on heritage components from previous Japanese missions, using robust space-proven hardware. Astro-H is equipped with two three-panel solar arrays using triple-junction gallium-arsenide solar cells with a power efficiency of 28.3%. The two solar paddles form a panel facing to one direction, no solar array rotation for sun tracking is employed. The Astro-H spacecraft has a beginning of life power of 4,000 Watts that will drop to 3,600 Watts at the end of the mission. The solar panels, measuring 4.2 by 2.5 meters per wing, consist of an aluminum honeycomb structure with Kapton-covered Carbon-fiber reinforced polymer facesheets. The power generation system uses 33 cells installed in series with 192 strings of cells. A dedicated avionics unit is responsible for the conditioning of the satellite’s main power bus and of the regulation of the state of charge of the onboard batteries. A two-cell battery system with a total capacity of 200 Amp-hours is used to store power. It weighs 96 Kilograms and measures 39 x 24 by 27 centimeters in size, comprised of 12 cells operated in series. The Power Control Unit delivers a regulated bus at a voltage of 51 to 52 V.
A shunt dissipater is used to regulate the incoming current from the solar array, using 14 digital and 7 analog stages with shunt currents set at 3.3 A for the digital and 1.1 A for the analog stages. The state of charge of the battery is controlled by a Battery Charge Control Unit, protecting the system from overcharging the battery and also controlling the thermal environment of the flight battery. The battery system is redundant in architecture, allowing one of the two strings to suffer a failure and still allow the system to deliver power. Astro-H is equipped with a Star Tracker Assembly consisting of two optical heads and corresponding analog and digital electronic units building a redundant system. The two star trackers are mounted on the optical bench, co-aligned with the telescopes. Two of the star trackers are used at a time to acquire imagery of the sky that is analyzed by a software algorithm which compares the acquired star patterns with a catalog to precisely determine the spacecraft’s orientation in space. Each star tracker has a field of view of 8 by 8 degrees and uses a CCD detector operating at 1Hz. In addition to its Star Trackers that have a maximum acquisition rate of 0.1 deg/s, Astro-H uses a pair of Inertial Reference Units for three-axis attitude and rate sensing that ensures control at higher rates e.g. during initial attitude acquisition. Additionally, an Earth Sensor and Coarse Sun Sensors are installed on the satellite to ensure good Sun/Earth-pointing in spacecraft safe mode. 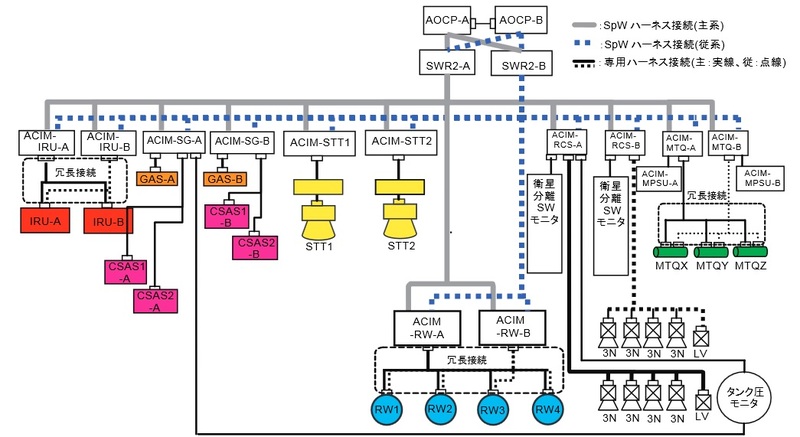 Attitude actuation is provided by a propulsive attitude control system featuring a series of 3-Newton Hydrazine monopropellant thrusters as well as a Reaction Wheel Assembly and magnetic torquers that are used in spacecraft safe mode and during RWA momentum dumps. 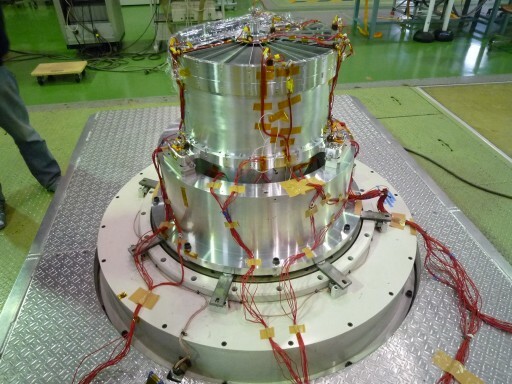 For the operation of the telescope payloads, Astro-H has to be capable of holding a very stable attitude over the course of the instrument integration times. Four reaction wheels, controlled from redundant Attitude Control Interface Modules are the primary actuators used by the spacecraft for pointing and attitude control. With four wheels, one could fail without impacting the controlability of the spacecraft. Three magnetic torque rods, controlled by two redundant interface systems can be used for attitude control in spacecraft safe mode and to support regular momentum dumps from the reaction wheels that need to be de-spun periodically. The propulsion system of the Astro-H spacecraft consists of eight three-Newton thrusters that can be used for orbit maintenance and adjustments as well as attitude control. The system consists of two banks of four thrusters, each bank isolated by its own latch valve. The attitude determination and control system has two fully cross-strapped controllers that process the data delivered by the sensors and actuate the wheels, torquers and thrusters based on the current attitude profile. 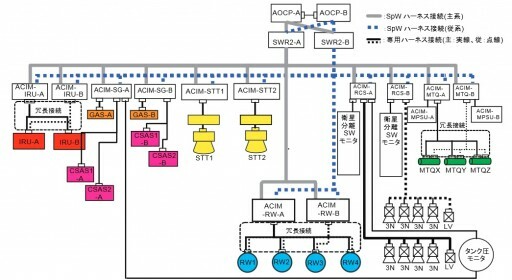 The Astro-H data system is in charge of command reception and execution, payload system operations, housekeeping operations and spacecraft control. Communications with the ground use a large deployable antenna to comply with the downlink requirements for this mission. 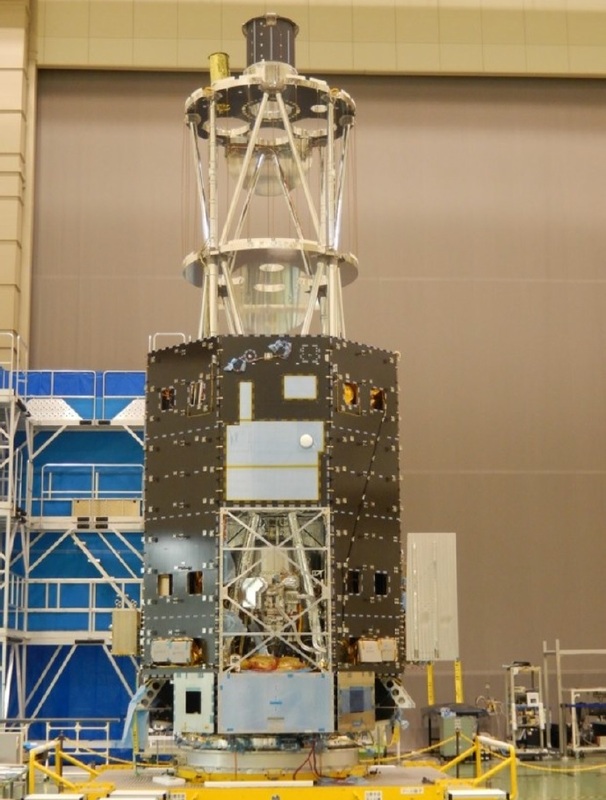 Astro-H is equipped with two Soft X-Ray telescopes, one feeding an imaging detector to deliver images in the soft X-ray band and the other connected to a spectrometer to deliver high-resolution spectral data of the target that is simultaneously recorded in image and spectrum. The Soft X-Ray instruments cover an energy range of 0.3 to 12 keV. Each telescope assembly consists of a mirror assembly, a stray light baffle and a thermal shield. SXT has a focal length of 5.6 meters and a diameter of 45 centimeters. 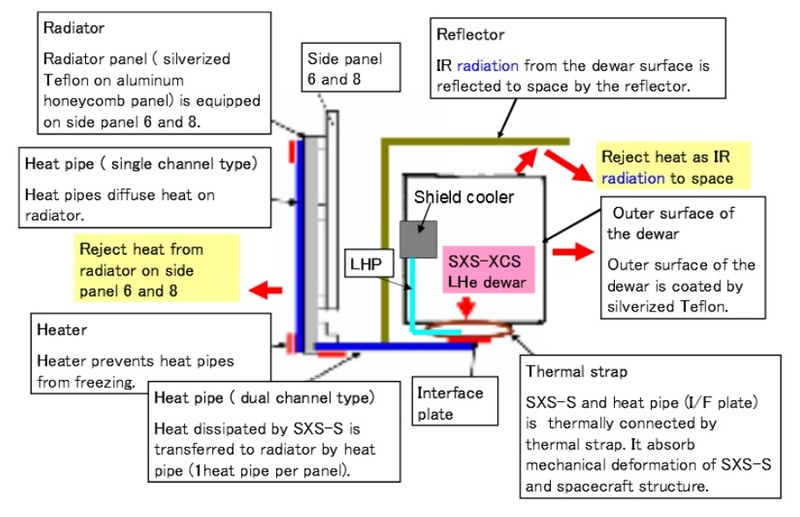 The thermal shield keeps the mirror temperature constant at around 20°C. 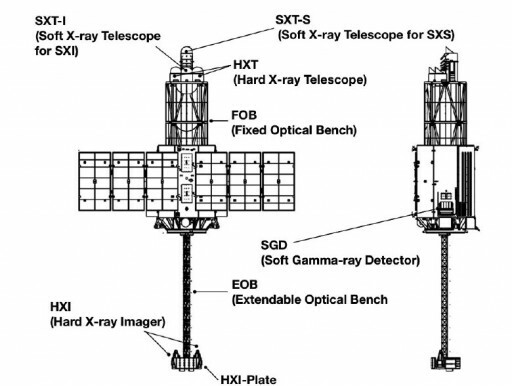 Both Soft X-Ray Telescopes were developed and built at NASA’s Goddard Spaceflight Center where they also underwent calibration before being sent to JAXA for integration on the satellite. 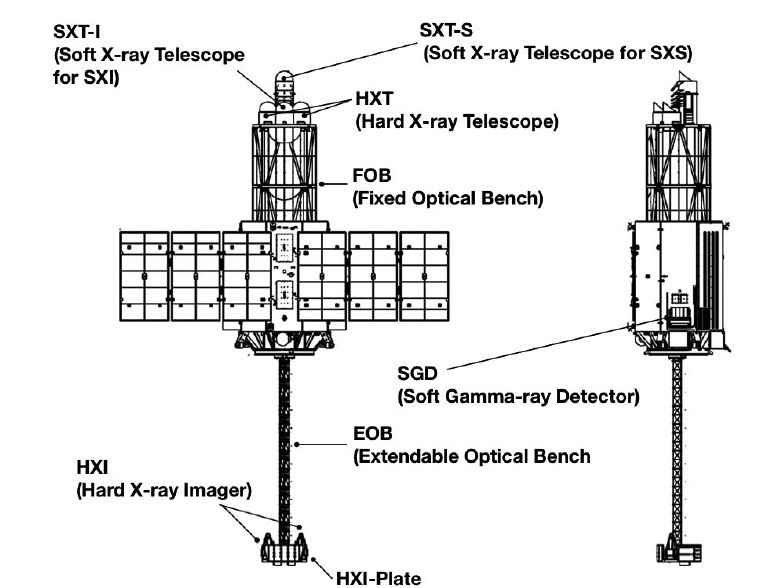 To capture X-rays at the desired energy levels, SXT employs a Wolter I telescope design that uses only grazing incidence optics because the conventional telescopes employing lenses or mirrors are of no use for X-rays – transparent lenses have a refractive index substantially different than one whereas X-rays require refractive indices very close to one, and mirrors, when used at near-normal incident angles, will not reflect the x-rays, instead transmitting or absorbing them which is of no use when trying to focus X-rays onto a detector. Therefore, X-ray optics are only useful if the angle from the plane of reflection is very low, typically below 2 degrees. These grazing incidence mirror arrangements were first outlined by Hans Wolter in the 1950s with the Type I design being the most frequently used option in modern space-based X-ray observatories. The SXT optics consist of 203 nested shells, each being segmented into four quadrants. Gold coating is used for the optical systems that focuses the X-rays onto the detector assemblies. 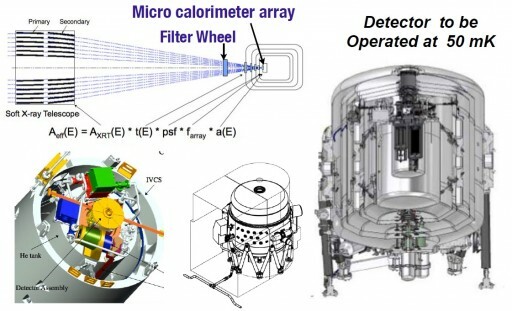 The Soft X-Ray Spectrometer System is fed by one of the two Soft X-Ray Telescopes and consists of a filter wheel assembly, an X-Ray Calorimeter Spectrometer and a cooling system. The X-Ray Calorimeter Array XCS consists of a 36-pixel detector arranged in a 6 x 6 array and capable of delivering X-Ray spectra at an energy resolution better than 7eV for energies between 0.3 and 12 keV. The pixels consist of an 8.5-micron thick Mercury-Telluride absorber attached to ion-implanted silicon thermistors on Si micro-beams. The pixels are 814 micrometers wide suspended on a 832-micrometer pitch. The instrument has a field of view of 2.9 by 2.9 arcminutes. For operation, the SXS focal plane assembly is cooled down to an operational temperature of 50 Milli-Kelvin. The cooling system consists of a three-stage Adiabatic Demagnetization Refrigerator, superfluid Helium-4 Joule Thomson cryocooler and two-stage Stirling cryocoolers. The Adiabatic Demagnetization Refrigerator launches with 30 liters of Liquid Helium to act as a heat sink. Overall, the cooling system regulates the detector temperature to within 2 micro-Kelvin for at least 24 hours. Blocking filters and vapor-cooled shields consisting of aluminized polyimide are used to block UV radiation. The wavelength range of the SXS instrument covers a number of important bands of iron and potassium for which the instrument has a collecting area ten times larger and is more sensitive than previous X-ray instruments. The broad bandpass of the instrument covers the critical emission and absorption lines of iron between 6.4 and 9.1keV. These lines are particularly useful because of their high strength, the spectral isolation from other lines and the simplicity in the underlying atomic physics. The Fe lines can be used to reveal conditions in plasmas that can be found in stellar accretion disks, galaxy clusters and other stellar objects. In cooler plasmas where silicon, sulfur and iron fluorescence and recombination occurs, the Fe emission lines can be used as an indicator for non-equilibrium ionization. 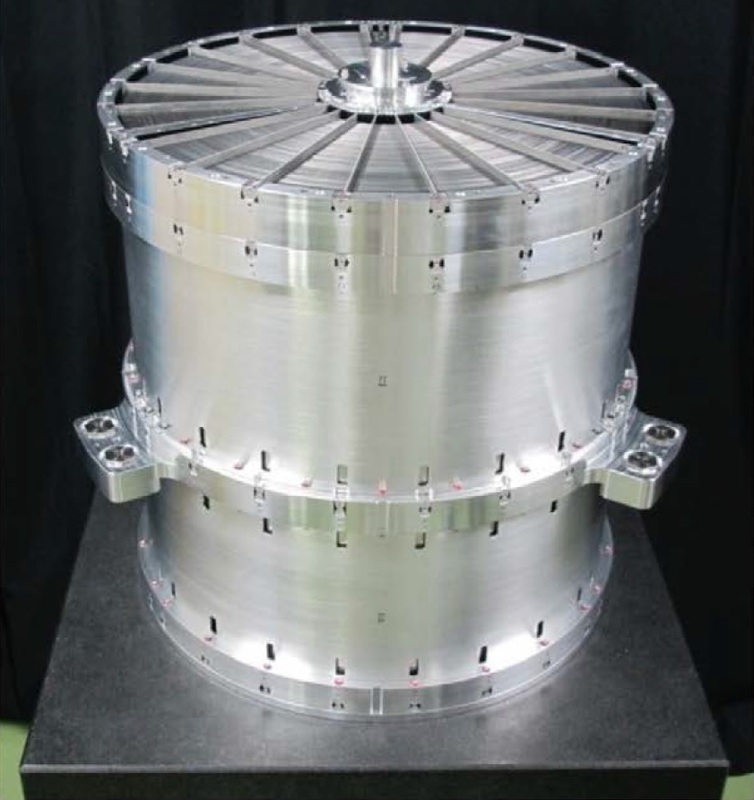 To ensure good performance of the instrument, a filter wheel is installed around 90 centimeters from the detector. The filter wheel can rotate suitable filters into the optical path to optimize data quality depending on the characteristics of the source. The wheel also includes an X-ray calibration system featuring light-sensitive photo-cathodes. Using the calibration system for a proper calibration of the energy scale, the instrument can achieve an accuracy of 1-2eV. 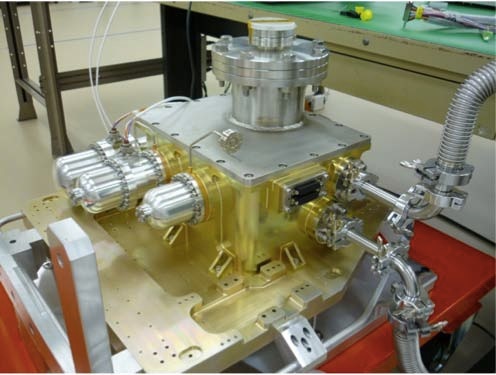 The imaging system of the Soft X-Ray instruments is fed by the second X-Ray Telescope Assembly and features a silicon charged coupled device detector. 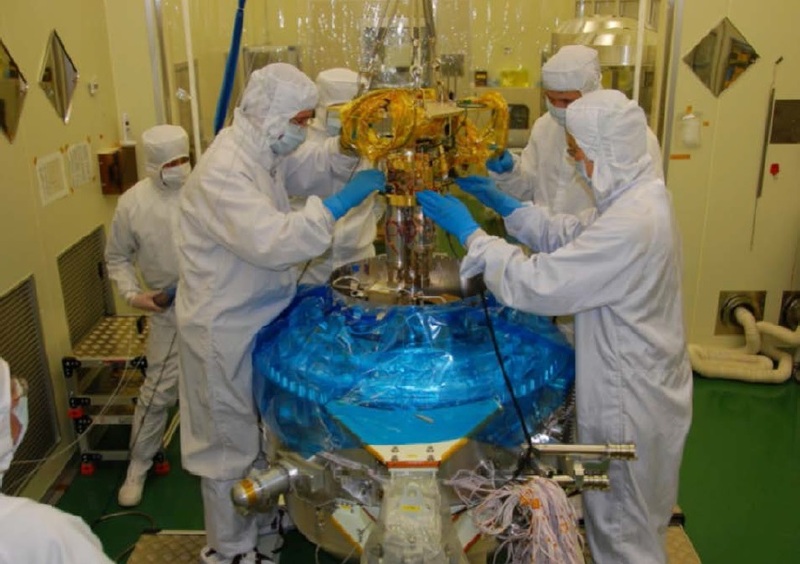 XIS is comprised of an imaging mirror, the Soft X-Ray Telescope and the Soft X-Ray imager SRI in addition to a cooling system. The detector system features a thick depletion layer of 200 micrometers, low noise and no cosmetic defects. It has a bandpass of 0.4 to 12keV. The XIS detector array consists of four backside-illuminated charged coupled devices with integrated frame storage. Each of the CCDs is 3 centimeters wide corresponding to 1280 pixels per row, making use of standard 24-micron pixel size. 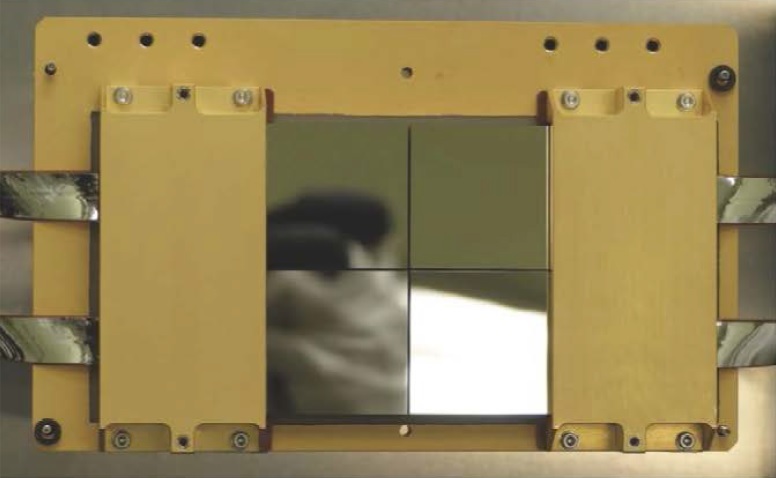 There is a 100-micron gap between the four CCDs, arranged in a 2 x 2 array to create a field of view of 38 x 38 arcmin. A mechanical cooler maintains the focal plane assembly at an operational temperature of -120°C to reduce dark currents. The aim point of the telescope is aligned with a position 4.3 arcmin off-center (vertically and horizontally) so that the target is not falling in the center gap between the CCDs. The field of view of the instrument is co-aligned with the smaller FOVs of the other instruments. The design of the multi-layer coated Hard X-Ray Telescopes permits spectral imaging at high wavelength not possible by most X-Ray instruments. Typically, instruments are limited in wavelength range due to high un-rejected backgrounds caused by cosmic X-ray radiation and particle events that dominate for wavelengths over 10 keV. This can be avoided by reducing the detector size and measuring the time-variable background simultaneously with the source for subtraction in data processing. This is only possible for a focusing X-Ray telescope in conjunction with an imaging detector sensitive to the hard X-ray spectrum. HXT features a multi-layer mirror that makes use of total external reflection and Bragg reflection. To ensure a high reflectivity at energies above 80keV, HXT employs a unique hard X-ray focusing mirror design. The HXT consists of three components – an X-ray mirror, a stray light baffle and a thermal shield. The optical design also features the Wolter I arrangement using grazing incidence angles to focus the radiation onto the detector assembly. The outer and innermost reflectors have diameters of 120 and 450 millimeters and the optical assembly features 213 nested shells per quadrant for a total number of reflectors of 1278. The two Hard X-Ray telescopes are coupled with identical detector systems making use of conical-foil mirrors with graded multilayer reflecting surfaces that provide a 5-80 keV energy range. The Hard X-Ray detectors are installed on an extendable optical bench supported on a deployable truss structure. 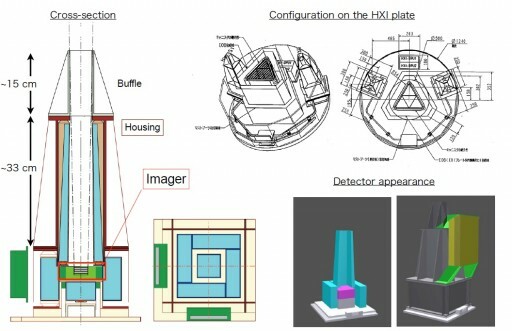 The sensor of the HXI instrument consists of four layers of half-millimeter thick Double-sided Silicon Strip Detectors and one layer of 0.75-millimeter thick Cadmium-Telluride serving as the imaging detector. This design allows Soft X-Rays at energies below 20 keV to be absorbed by the silicon layers while hard X-ray photons possess sufficient energy to penetrate the strip detectors and reach the CdTe. 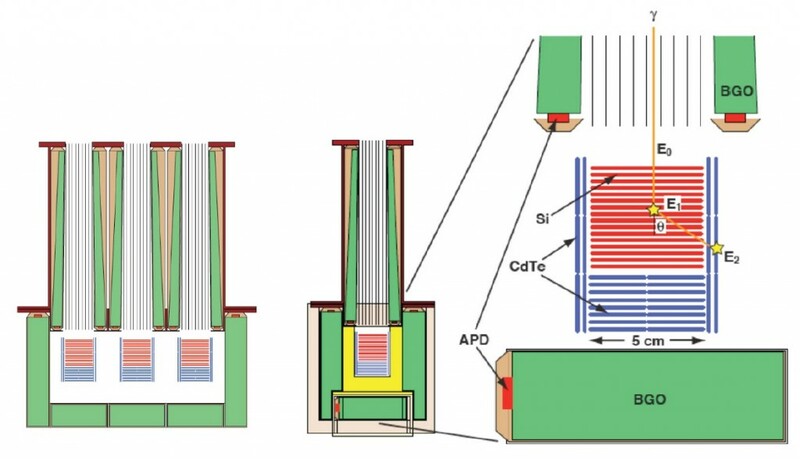 The 3.2 x 3.2-centimeter Double-sided Silicon Strip Detectors cover the energy range below 30eV while the CdTe detectors cover the 20 to 80 keV band. Using a layered structure, the read-out from the different layers can be used to deliver valuable data on the interaction depth which is of importance for background reduction because low-energy photons detected in the upper layer can be rejected. 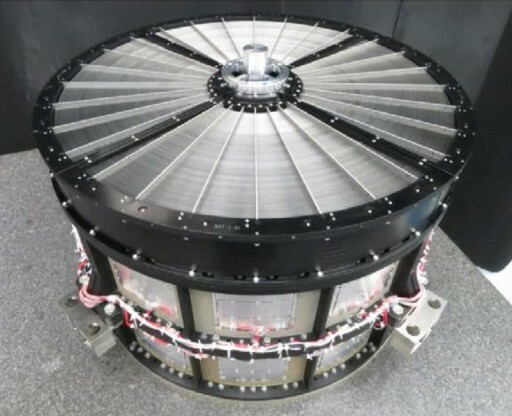 For the rejection of the cosmic background of photons coming from directions outside the Field of View, HXI uses an active shield made of Bismuth Germanate Scintillators that convert the energy of incoming electrons and protons striking the scintillator to photons. The light pulses are detected by the Photomultiplier and generate an electrical pulse which is then routed though an amplifier and recorded for the differentiation between source and background events. The HXT instrument achieves a spectral energy resolution of 2 keV. 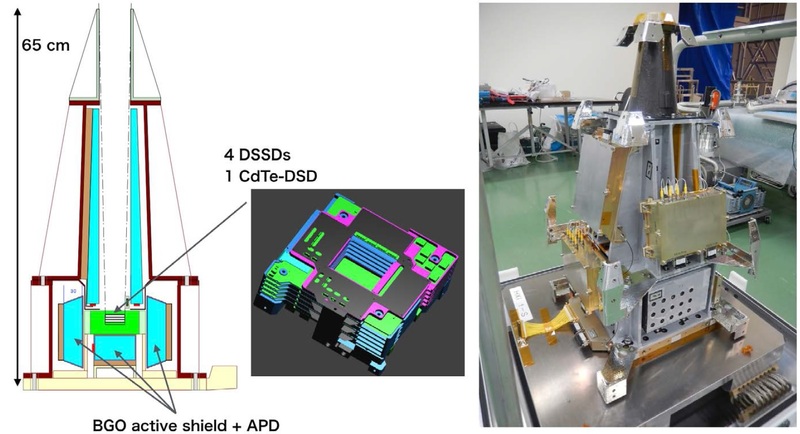 The SGD can measure gamma-rays at energies of 40 to 600 keV with a very high sensitivity, using a Compton camera and a reconstruction of Compton scattering. Through the use of an optical system, the Compton camera directs incoming gamma-rays to Silicon/Cadmium-Telluride semiconductor detectors. Incoming gamma rays are scattered in the silicon detector and fully absorbed in the CdTe detectors. The direction of the incoming ray can be calculated through using the deposited energies and interaction positions recorded within the detectors and with that information solve the Compton kinematics. 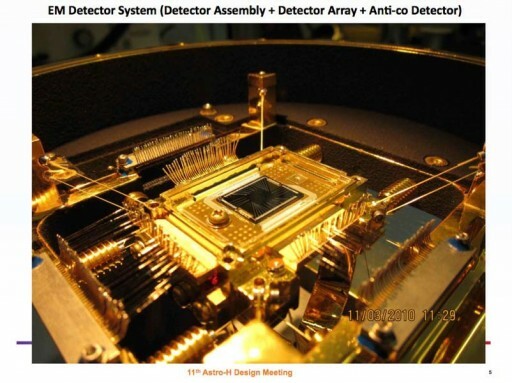 The detector consists of 32 layers of 0.6mm silicon pad detectors and eight layers of CdTe pixelated detectors each with a thickness of 0.75mm. 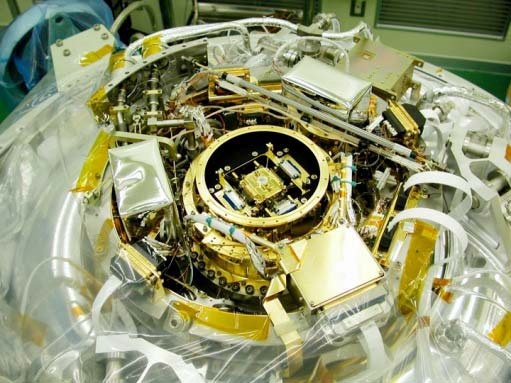 The side panels of the instrument are surrounded by two layers of CdTe pixel detector arrays. An active shield is employed to reject rays coming from outside the camera’s 10-degree field of view.